Over 80 children from local schools, Distington Community and Seascale Primary attended the event at the Whitehaven museum alongside Prism Arts Studio Theatre Members. The project is led by Prism Arts and supported by heritage partner The Beacon Museum, Sellafield Ltd and National Nuclear Laboratory (NNL). The day focused on Cumbria and its role in developing science and technology from 250 years ago to present day. Ali McCaw, Prism Arts’ Lead Artist, said: “This day marks the beginning of a new exciting two-year project. “We have started by looking at the Cumbrian scientist John Dalton and then leaped through time right up to the 1950s and the arrival of the nuclear industry in West Cumbria. “We’re very fortunate to work with two local schools, with some of the children’s parents actually working in the nuclear sector. 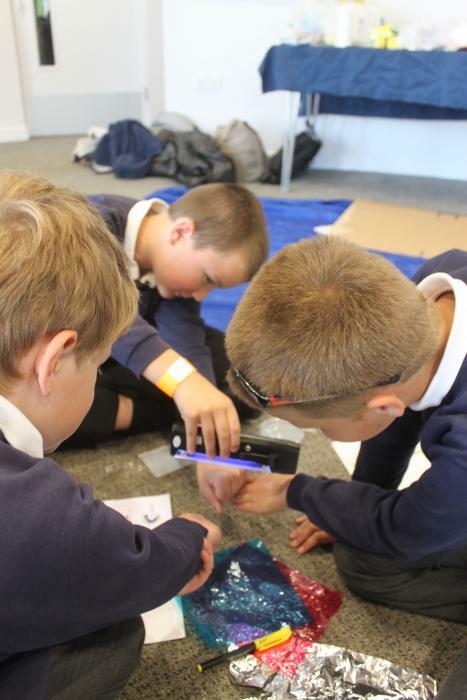 Throughout the day children were introduced to a whole host of scientific facts and knowledge, through workshops run by Sellafield Ltd and NNL. Margaret Crichton, Senior Teaching Assistant at Distington Primary School, said: “We’re all really looking forward to getting involved in the project. “The kids have been dying to get stuck in. Obviously since it’s a very important subject in West Cumbria. Ellie May Hewer, aged nine, of Distington Community School, said: “I was really excited this morning knowing I was coming to The Beacon today. Derren Lynch, aged nine, of Distington Community School, said: “It was really fun. We got to make a boat out of a card and straws and we had to make sure it was protected against a tsunami. Elizabeth Kwasnik, Beacon Museum Director, said: “It is a key element of our role as Copeland’s museum to help our young people learn about the scientific history of the area as well as the industrial and social history. Julie Betteridge, Director of Customers and Communities at Copeland Borough Council, said: “We are all about collaboration between The Beacon and our local community. “We are happy to be working alongside our partners to teach children about the importance of science and in particular its links to the local industry.